Metro Detroiters recently raised their glasses for some good causes in Royal Oak. On Jan. 18, Royal Oak craft beer supporters, the Polar Beer Club, threw the Royal Oak Beer Fest at the city’s farmer’s market. The sold-out event funneled its donations to multiple charities, including AIDS Walk Detroit. AIDS Walk Detroit is Michigan’s largest grassroots HIV/AIDS fundraiser. Since 1991, the Royal Oak-based charity has held several fundraisers throughout the year, including their annual 5K walk through Royal Oak every fall. This year’s Royal Oak Beer Fest included food samples, local and national beer presence, and even games. A highlight of the crowded affair included the super-sized “Jenga” near the entrance, with strangers quickly becoming friends as they played. Some stand-out samplings included the large Sierra Nevada station, handing out this year’s Bigfoot and the expensive quad, Ovila. Grand Rapid’s Brewery Vivant was present to hand out many of their mainstays, while Quebec’s Unibroue was on hand with their world-renowned La Fin du Monde Golden Ale. Representatives of the charities being supported, like Vista Maria, were present throughout the night to hand out information on their causes. Information on the charities, as well as this year’s Royal Oak Beer Fest, can be found at www.royaloakbeerfest.com. On Jan. 25, the Royal Oak Craft Beer Fest took a slightly more personal focus with its Royal Oak Music Theatre event: Everyone working the festival was a volunteer for Camp Casey. The festival was in its third year of working with Camp Casey to bring donations to the unique, local non-profit, with many LGBTs present both behind and in front of the beer sampling. Some of the beers present included Bell’s well-known Hopslam and a unique combination at Founder’s: their Centennial IPA mixed with Blood Mary Mix. Craft liquor from Detroit-based Two James Spirits was handed out as well. Camp Casey is a Royal Oak-based organization that runs a horseback-riding program for children with cancer. Founder Molly Reeser was present at the festival the entire night, while many people pouring drinks or handing out fliers were personally touched by the nonprofit. One pourer, Nicki, excitedly volunteered; her daughter had received a “Horsey House Call” while suffering from cancer, and is thankfully now in remission. Camp Casey was started as a dedication to Reeser’s best friend, Casey, who passed away from cancer at age 13. In college, Reeser decided to turn her friend’s love of horses into a passion to be shared with others suffering from the disease. Ten years later, the charity has become Michigan’s own answer to “Make a Wish,” focusing on the seemingly universal love of horses most children have. Funds raised from the various events thrown in Royal Oak throughout the year go toward various aspects of the charity, including funding “Cowboy Camp Outs.” The campouts happen two times a year, where children are able to go to a real “Dude Ranch” and experience Wild West living. The Royal Oak Craft Beer Fest funds will also be funneled toward “Horsey House Calls,” where very ill children are able to see and pet horses brought directly to their homes. 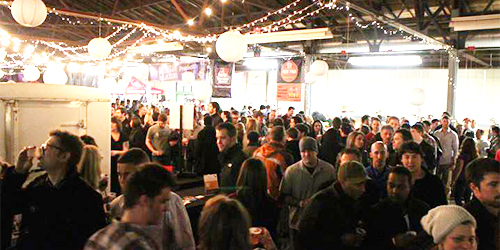 Charity events in the Royal Oak area will occur throughout the next several months to benefit Camp Casey, including “Dabble,” a wine and craft beer tasting event on Valentine’s Day at Rust Belt Market in Ferndale (www.dabbledetroit.com). Other upcoming events in the area for Camp Casey include the Cowbell Pub Crawl in Ferndale on March 29 and the Gardenia Bluegrass & Roots Festival at the Royal Oak Farmer’s Market on April 11. For further information on Camp Casey and their events, visit www.camp-casey.org. Royal Oak Craft Beer fest information for this year’s event can be found at www.royaloakcraftbeerfest.com.